I lied, like, a little bit. The x-pluses didn’t really want to be first. Really, the x-pluses want 1) more grey fabric (I am making the 12” size and I need 5.5” squares of grey! 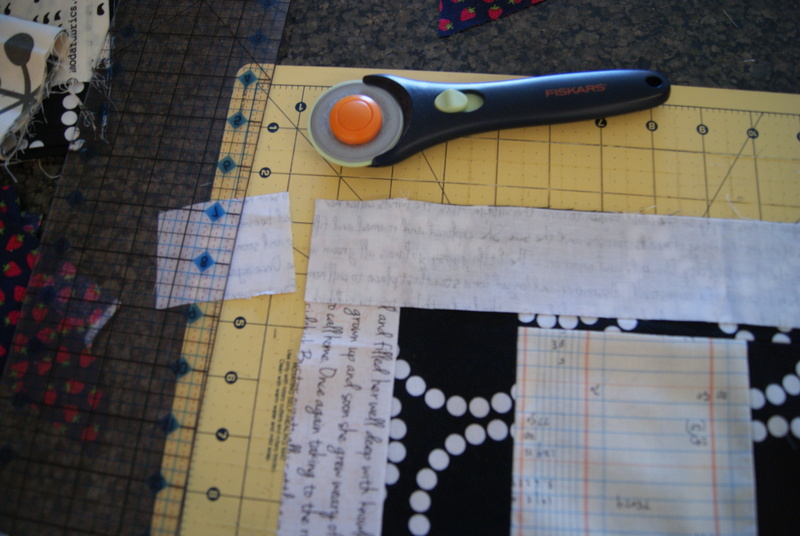 Not effective to cut from fat quarters, so I have a pile of half-yards coming); and they want 2) me to keep them. For myself, forever. I really do have to give this one as a wedding gift, though. One small note on block construction: You absolutely do not need any kind of tutorial or whatever to make these. You can do it yourself. BUT, but. It is kind of nice when the measurements you choose make it easy to cut one nice width of fabric, selvege to selvege (WOF) strip per block, yeah? and sashed again with a 2” strip. That last 2” strip I was able to cut just WOF, and had a teeny rectangle leftover, like in the second photo (improv block for the back, anyone?). The blocks are 11.5”, 11” finished (such a nice easy number to multiply to figure a final quilt size). Fantastic quilt top – I totally see why you want to keep it for yourself. Sadly, I don’t get the Animal Collective reference but I am totally in favour of giving quilts obscure, insider joke names. Keeps things interesting! This is so lovely! I love the colors in it. Too bad you can’t keep it but I’m sure the recipients will cherish it! I agree with Adrianne about the name. 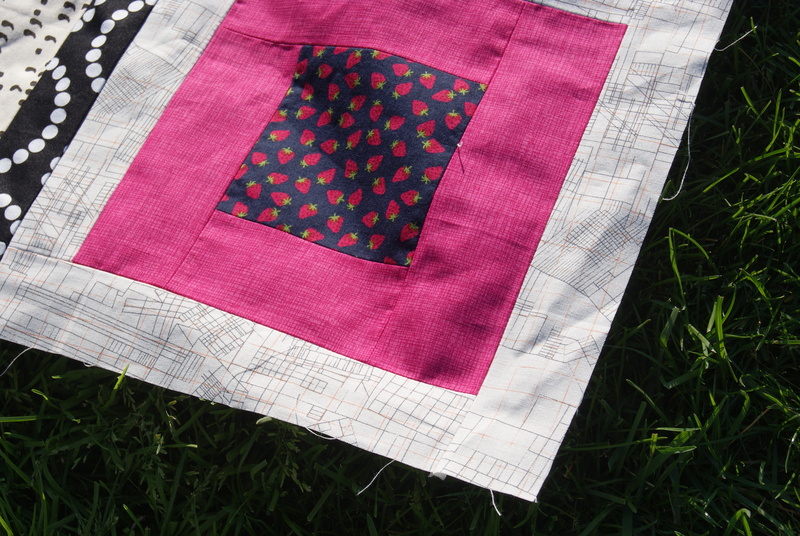 I love that strawberry print too – do you have any more left to make something for you? A pouch like your friend suggested? 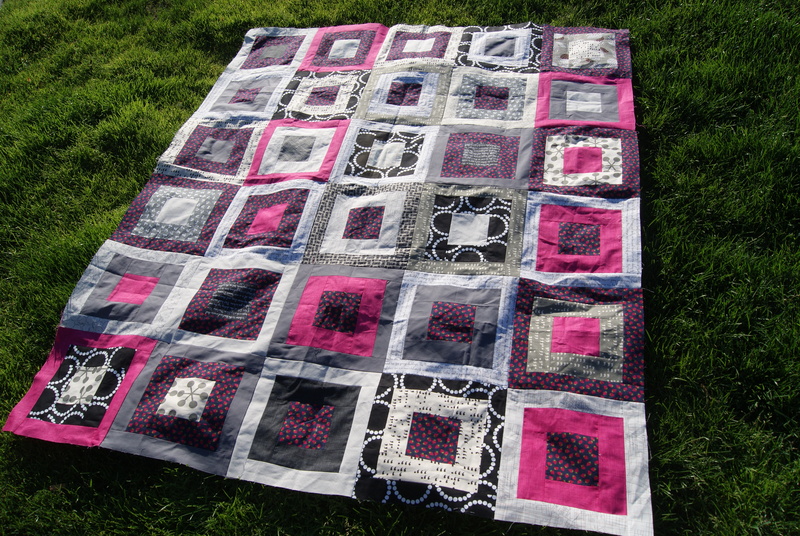 The quilt top looks great – nice mix of colors and fabrics. love your quilt! I’m such a sucker for quilts with lots of squares. love the colors too! Such beautiful colors very modern! i love this. i love the strawberries, the low volume, the obscure name. i even love that making this means you get to buy more low volume fabric. yes. and, and, AND, i love that this means you’re keeping the X-plus quilt for yourself! YES. When life gives you scraps, make jam. Lovely quilt top! And I Do get the Animal Collective reference – very clever! Great quilt, I love that colour combination at the moment….. and I’m happy to say I love that album too, I dug it out the other week to listen to while sewing!! Very, very pretty. I love the fabric catcher table too…mine is the hutch in my dining room, which is where I sew. Girl, you are a machine lately!! I’m so jealous of your quilty work ethic – I’ve been feeling uber lazy lately and need to get it together and get working. These fabrics work so well together. I love black/white/grey with pops of color. Great use of such fabulous scraps! I also really like the name-I’m not creative enough with my quilt names!! Love the colors in this quilt. Love your strawberry jam – looks good enough to eat!! I love the name and the close up of that first block. Pretty! I love the look of your blog-the colour photos show up so well with the fresh background. Well if you are going to complain about making it and blame me you can always send it to me, lol. 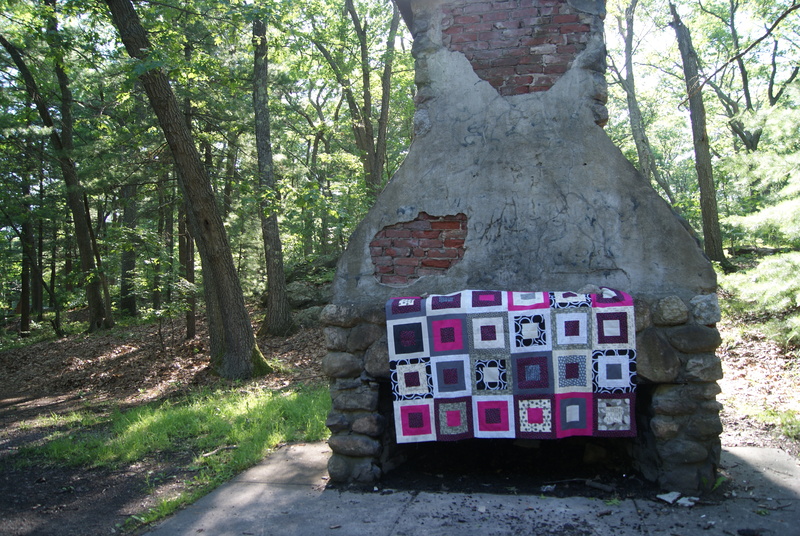 Okay fine keep your scraps and your awesome quilt top!!!!!!!!!! I love it! And you were super duper quick too!